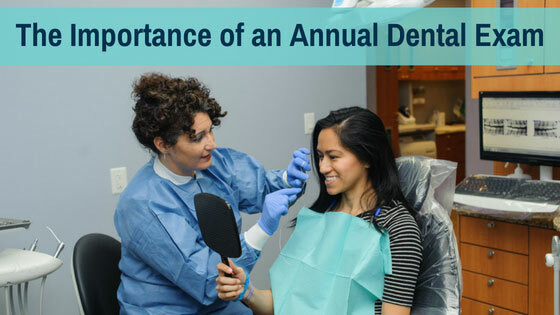 Are annual dental examinations really that important? A dental examination, like other regular medical checkups, is a frontline method of detecting abnormalities and disease and staying healthy. In fact, statistics have shown that many people see their dentist more often than they see their primary care physician. As such, seeing a dentist annually may help people avoid severe complications from both a medical and dental health perspective. A comprehensive examination covers the patient’s teeth, gingiva, jaw, face and neck. Most people would be surprised to hear that dentists check the patient’s face and neck for signs of disease, but it’s true. And this includes life-threatening disease like cancer. Clearly, the importance of an annual dental exam cannot be overstated. What is included with a dental exam? A visual examination of the teeth and gingiva – A dentist can glean a lot of information just by looking at the condition of the patient’s teeth and gums. If there is any discoloration, staining, inflammation or structural issues with the teeth or gums, they will be readily apparent. A visual examination will give the dentist insight into your overall oral health and level of hygiene, and this will be important for diagnostic reasons. If there are signs of gum disease, they will also be apparent, and this will require attention to prevent the problem from worsening. Assess the patient’s risk of tooth or root decay – Tooth decay is a common, but attention-demanding condition. It must be treated quickly, as the decay will worsen with time, and may even spread to neighboring teeth. If tooth decay is caught early, it can often be treated with a small, simple filling. If it is not caught early, the tooth may need to be removed or a root canal performed. A filling is much preferred, so don’t wait to get checked out if there is any sign of a cavity or root decay present. This includes a lingering toothache that seems to occur without cause, tooth sensitivity, or tooth pain when eating or drinking something hot, cold or sweet. Take X-rays – X-rays won’t always be necessary, but most dentists prefer to take them at least once a year. If there are any concerns with the teeth, bite or jaw, then X-rays will be required for an accurate diagnosis. X-rays are also needed to track the progress of some dental treatments, or to check how a child’s teeth are developing and coming in. Check for serious disease, like cancer – Oral cancer is treatable, in most instances, if it is caught early, or if precancerous tissues are identified before they have a chance to progress to cancer. Early diagnosis is critical, like with most cancers, and the longer oral cancer has to develop, the greater the risk it poses to the patient.During a dental examination, the dentist will check for any signs of cancer, including examining the lymph nodes. There are a few approaches to oral cancer screening, and the dentist will likely consider the patient’s risk factors before deciding on one. The dentist may use a gloved hand to feel the inside of the patient’s oral cavity, searching for any abnormal tissue. Other methods of cancer screening include using a blue dye or a blue light to search for optical contrast between normal and cancerous tissues. Check the patient’s jaw and bite for abnormalities – Jaw and bite abnormalities are rarely the result of anything the patient does but are instead inherited. Although many people adapt to their abnormal bite without any apparent difficulty, allowing it to go untreated can result in eventual complications. Persistent gum irritation, accelerated tooth decay, and speech or chewing impairment can result from poor bite or jaw alignment. Fortunately, there are treatment options available for people with either, or both, and a dentist can help the patient determine the best option for the individual. Perform a cleaning – There are multiple teeth cleaning methods available, and the proper method will depend on various factors. Regular cleanings are important for continued dental health, and will also uncover any hygiene-related oversights, such as not brushing sufficiently or failing to use dental floss. It is especially important that children receive regular cleanings, as their brushing and flossing abilities take time to develop. A cleaning can help make up for any inconsistencies in oral hygiene among children. Oral health counseling – During the examination, the dentist may inquire about the patient’s dietary and oral hygiene habits, as well as any medications the patient is taking. This will likely include questions about tobacco use and about the patient’s overall health, the latter of which can have a significant impact on the patient’s dental health. Patients with diabetes, for example, are at a far greater risk of developing gum disease.If the patient has dentures, implants or other prostheses, the dentist can examine their condition and inform their patient about how to keep them clean and comfortable.Some patients have health conditions that impact their ability to properly take care of their teeth. Patients with arthritis, for instance, may find it too painful to maintain form while brushing their teeth. Dentists see patients like this all the time, and can recommend techniques that will reduce strain while ensuring good dental hygiene. Every medical professional would much rather prevent disease than treat it, and this is true of dentists, too. Annual dental examinations are an essential part of oral disease prevention.